Third coin issued by the Republic of Palau in 2013 belonging to series: Squirrel's Over the World. It depicts the Ground Squirrel enriched by a black Swarovski and features antique finish quality. This great collection is having an extremly high international request, thanks to the particular design full of details, the high quality and the very limited mintage. 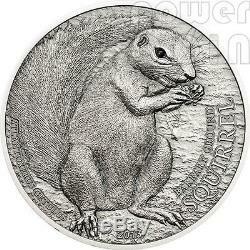 The coin reverse depicts a ground sqirrel with a black Swarovski eye shaped. The squirrel is represented in his natural habitat on the ground. On the right side the inscription "Barbary Ground Squirrel" and on the left the year of issue. 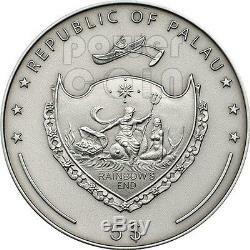 The coin obverse depicts the Palau State Coat of Arms. Ground Squirrel The ground squirrels are members of the squirrel family of rodents (the Sciuridae) which generally live on or in the ground, rather than trees. It is found on the Barbary Coast of Western Sahara, Morocco and Algeria on the seaward side of the Atlas Mountains and was introduced into the island of Fuerteventura in the Canary Islands. The Barbary ground squirrel is a colonial animal and lives in family groups in burrows in dry grassland, bushy and rocky areas including disturbed agricultural land, or in dens among rocks. It tends to come out to feed early in the morning and again in the evening, retreating into its burrow during the heat of the day. It feeds on plant material and a major part of its diet is the fruit and seeds of the argan tree. If the population builds up and food is scarce, the Barbary ground squirrel may migrate. The females give birth to litters of up to four young, twice a year. The item "BARBARY GROUND SQUIRREL Over The World Black Swarovski Silver Coin 5$ Palau 2013" is in sale since Thursday, August 29, 2013. This item is in the category "Coins & Paper Money\Coins\ World\Australia & Oceania\South Pacific". The seller is "powercoin_italy" and is located in Roma. This item can be shipped worldwide.